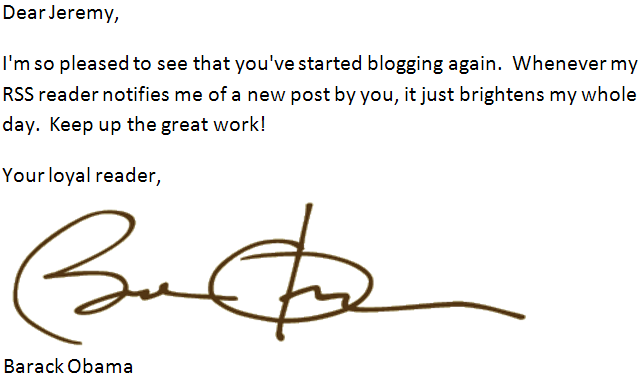 I received this letter from President Obama. If you don’t believe me, just look at the signature. It proves that the letter was written by the given person. Before photocopiers, you could assume that if you recognized the signature, it was created by the author. It proves that nothing was added to the letter. The signature is placed at the end of the text. You could tell if someone tried to add something. As you can see, this doesn’t really work with an electronic document. Many people finish an email message by typing their name. This is supposed to mimic a signature, but it provides neither of the above guarantees. Someone else could have sent the message with their “From” address, or the recipient could forward their message and modify its content to make it appear as though they had written something else. Some people scan in a copy of their handwritten signature and append it to their email. That’s even worse! No only does it have the same problems, but it also gives me an easy way to forge their real signature on a paper document. Don’t append your name to your email. Sign it! There is a right way to sign emails: it uses encryption and it’s supported in all the major email programs: s/mime. If you request a free certificate from one of the certificate authorities and install it in your email client, you can effortlessly sign (and possibly encrypt) your messages. No one can forge an email signed by you, and no one can alter it without breaking the signature. Let’s use email to its fullest, and not just imitate the obsolete methods of the past. Welcome to the future! March 16, 2012 1 Comment. Consider the ancient letters of the Apostle Paul. His letter was written on a scroll, and at the end of the letter he would write a few words in his own hand. If you recognized his handwriting, you’d know it was really from him, and the fact that he wrote his remarks at the end prevented anyone from adding anything to the letter. It was effectively a signature. March 16th, 2012 at 10:56 pm. Permalink.